21 | November | 2008 | can i just finish my waffle? District of Columbia Mayor Adrian M. Fenty has said Obama’s inauguration could lead to an unprecedented turnout of 3 million to 5 million people. Other estimates have anticipated crowds of about 1.5 million. 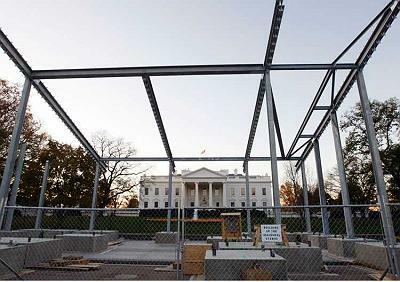 The framework is up for the presidential inauguration reviewing stand in front of the White House in Washington on Wednesday. The public transportation system is getting ready for record numbers. Hotels are filling up, and security will be tight. Don’t expect too much. Now they say don’t expect too much. But it was Mr. Obama himself, along with the swooning MSM, who built up this expectation. He has been saying what great things he will do for about two years. He was going to Washington to change it. Anybody who believed the hype is surely going to be disappointed. No doubt, he is inheriting horrible economic problems, but then wasn’t that one of the turning points of the election? And he promised! So don’t start the “expectations we are putting on this man” bit. He put them on himself.